With i-Series Plus, pretreatment operations have been automated, such as the processes to dilute samples and add reagents. This results in better reproducibility and measurement accuracy by minimizing human error, to ensure reliable data in the analysis of pharmaceuticals and foods. i-Series Plus also offers new features that satisfy data integrity requirements of the pharmaceutical industry. Application-specific solutions are available within the product range such as the Cannabis Analyzer for potency testing of primary active components of cannabis for medical use. It offers a simple procedure, complete with a column, methods, batches and report templates. Since the iSeries systems' release in 2014, they have been used for research and development activities, specification tests and quality control operations in a wide range of application fields, such as pharmaceutical, chemical and food industries. Support of data integrity features for the pharmaceutical industry. 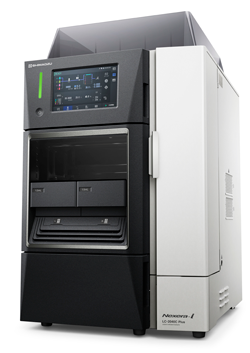 The i-Series Plus consists of the compact HPLC Prominence-i and UHPLC system Nexera-i. High speed analysis, simplified method transfer, minimized environmental impact and easy maintenance are just a few of the many new features of this product range.